Size 7 - $44.99 Only 3 left! If you want to be the glitziest gal in the party scene this year then you need to have the flashiest accessories. These Silver Glitter Boots are the perfect example of what you need. They will look perfect if you plan on catching a bad case of Disco Fever this Halloween. You could also slip these shiny boots on with a futuristic go-go girl outfit. If you plan on being a superstar in the world of glam rock, these high heels are a must have. 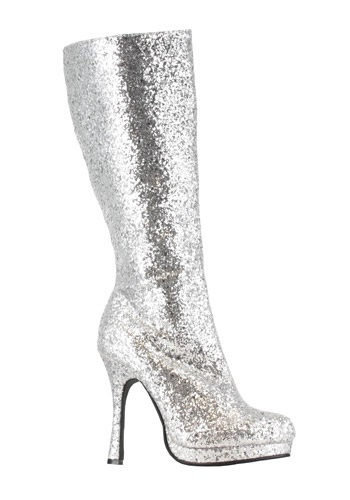 Those are just a few costume ideas that these Silver Glitter boots will kick up to the next level. We know you can think of even more! But you could also just add these to a fun outfit you plan on wearing for a night out on the town. They will make you sparkle out on the dance floor. Grab your own pair today and get your shine on!